Sigh. An email I got recently. “You can keep your data.” Ok, I think I will. I rarely blame people alone for their lack of financial knowledge, as there are many groups to blame — schools, companies, and Wall Street — but this guy is actively proud of not reading even one book. As with most people, education alone is not the answer to change his behavior, as he will never allow himself to be subjected to education. It’s interesting: People complain about their finances for nearly their entire lives — without ever reading one good personal finance book. Yet when you collect the data, you find predictable patterns. In their 30s, they wish they saved more to travel in their 20s. In their 40s, they wish they’d saved more for a down payment in their 30s. And in their 50s, they wish they’d saved for one simple thing in their 40s: retirement. Each of these groups could have done so in a period of a few weeks — then let their system automatically work for them. Read more rants about dumb people. Have to go with the other guy on this one Ramit. Your investment strategy advice is predicated on the assumption that the stock market will , on average, continue to perform as it has over the last 30 years. It clearly has not since 2008, and, clearly, will not in the immediate future. When he said keep your data, he meant that this historical data will NOT help you analyze whats GOING to happen given that we are in a season where the financial markets are not, and cannot behave like they have in the past. The past, in the situation we are in, definitely, tells you nothing about the future (and note that it did not tell you about the future even when the stock market was stable, it just seemed to). Read The Black Swan for an introduction to this theory. Taleb write abouts making decision around an investment strategy (even one centered on gold and silver) much more coherently than your email correspondent seems to have done. You definitely want to take some time to understand the thinking behind this approach if you have not. The one thing I agree with is that the past is not a guarantee of the future. On the other hand, history tends to repeat itself. As The Black Swan author asserts, certain “improbable” events happen with regularly. Therefore, history is indeed a valid indicator of the future, as many black swan events have already happened and are represented by historic data. To take this one step further, while no two catastrophic events are the same, the players are always present: human beings, companies and governments. These parties tend to react predictably and irrationally, with governments with knee-jerk legislation, people reacting on greed and fear, and corporations for profit. So, Ramit is assuming that the stock market will average what it has the past 30 years, based on 30+ years of data. You’re assuming the stock market will not perform like it has the past 30 years based on 3 years of data. Who is making the bigger assumption? Additionally, your use of “clearly”, twice in one sentence, to indicate overwhelming evidence in support of your point lacks any evidence whatsoever. Please don’t call me for a loan in 30 years. Yeah you said bestselling author that doesn’t mean s*** how about super successful investor. Your advice is pretty much worthless I’ll stick with thousands of years of a trend. I love how you can tell they have no idea what’s going on when they simply throw buzzwords and talking points out there. But I feel really badly for people like this, and I hope that this guy smartens up. Is gold/silver really the most _needed_ material that will be in limited supply in for instance 30-40 years? Are we even sure they will be demanded enough that gold/silver value will increase? Historical data is old garbage when I want to refute someone, but valid when it supports my decision! Even if it does not increase, it cannot decrease!! Unlike paper money….just keep on printing . You probably got identical e-mails 5-6 years ago from people talking about how housing and real estate are no-brainers. And if you were blogging 12-13 years ago you’d hear how tech stocks were no-brainers. All of these bubbles are the most fun on the way up. This kind of personality is very difficult for me to take as well. You really can’t discuss anything much except the weather with this guy, because he will have the same ridgid attitude about everything from politics to the best way to swing a golf club. There is never any conversation with these guys because any kind of conversation or communication involves listening with an open mind an heart. This guy can’t do that. If the dollar collapses then what “money” is he planning skating away with? Historically, when an economic system collapses then society reverts to a bartering system of goods and services. Basic living necessities will far outweigh the need for precious metals. Precisely. I always wonder about this when I hear people’s doomsday predictions for the collapse of the dollar. If the economy completely collapses, it seems like food, water and fuel will be far hotter commodities than gold and silver bars. Only the dollar is collapsing, other currencies *might* do just fine without a dollar. Essentially, the point behind going to gold/silver is not investment, it is risk mitigation. You know you are going to be skinned when whatever currency you have disappears so you buy something (gold/silver) that you can use to buy the new currency that takes it’s place. Its also important to note that that there is an intermediate step between currencies collapsing and going to bartering which is using a “universally” standard currency – typically gold or silver. Since you actually own the metal (which means you bough actual silver/gold rather than an investment certificate that assigns a value, in some currency, to the silver/gold you *bought*, then you can actually melt it down and trade your silver/gold for other stuff. I am really happy though that we have now moved from the ad hominem attacks to actually discussing the ideas presented. Seriously. If the dollar collapses, I have a feeling you won’t want to have invested in gold. You’ll want to have invested in canned food and ammunition. Aside from hoarding precious metals, I’m sure he’s planning on relocating once inflation gets out of control. As a like-minded investor, I’m planning on hopefully converting my gold/silver to Canadian Dollars, Brazilian Reals, Swiss Francs, or maybe an Asian currency. With the recent boom in gold/silver, it’s pretty easy to turn bullion into currency. And if worst comes to worst, and we do end up bartering for goods and services, then gold/silver will be KING. The stock market is a fixed game. Long-term investing is dead. If you want to educated yourself, read books of value by economists such as Jim Rogers, Peter Schiff, Marc Faber, Nassim Taleb, etc. Jim Rogers is a perfect example of an economist who understands commodities. He made enough to travel the world for several years on a motorcycle. He has now relocated his family to Singapore and lives a very happy life abroad. I’m from Southern California and cannot stand the average person’s mentality. I love the weather, my friends, and family, and of course the convenience of life. I do not see myself living in the US for much longer. I’m sympathetic to the other guy as well. But I wouldn’t recommend putting ALL of your money in gold/silver. As Steve said, it’s a hedge and not an investment. Speaking of predictable patterns, almost all of the currencies the world has seen are now worthless, except precious metals. You can’t always rely on the past as an indicator. Diamonds have always been extremely valuable, but then something revolutionary happens (like the ability to manufacture diamonds) and suddenly their value is dictated by a different set of variables. Likewise, the dollar will be fine . . . until it crashes. The problem with the “other guy”‘s view is that we don’t know when the dollar crash. It may not be in our lifetimes. The problem with Ramit’s view is failing to recognize that revolutionary events can and do change the rules. Clearly Vito is making a mistake by not understanding the arguments of a wide range of financial advice. (also, Vito, if you read this, I would strongly recommend reading fofoa, ie http://fofoa.blogspot.com/2010/12/focal-point-gold.html and http://fofoa.blogspot.com/2011/04/deflation-or-hyperinflation.html). Sorry, but how can you compare ~100 years of dollar denominated stock market growth with 6000 years of gold’s storage of value ? And argue that the stock market is clearly better ? The long run value of any fiat is zero; this has been proven time and again. The only question is if we will see the dollar’s long run in our lifetime (my bet is yes, but unlike Vito I am hedging some wealth in paper assets in case I’m wrong). There are a number of powerful arguments that the next couple of decades will look little like the last decades (see http://www.amazon.com/gp/product/047092764X/ref=pd_lpo_k2_dp_sr_1?pf_rd_p=486539851&pf_rd_s=lpo-top-stripe-1&pf_rd_t=201&pf_rd_i=1594489025&pf_rd_m=ATVPDKIKX0DER&pf_rd_r=16KAD10ZPZZARAKMBZX3 for a mainstream example). The returns of paper financial instruments over the last 70 years are *no* guarantee that they will continue at said pace. I would not want to be holding much paper when, for example, the rest of the world decides the dollar reserve status is no longer in their benefit; or when the US government hits a 200% debt/gdp ratio, probably both of which will happen in my lifetime. So I think that guy might have a point. He’s investing in things, has a system, and taking action. That’s a lot better than most people who are paralyzed. When he loses his shirt then he’ll have some real experience instead of just data, and he’ll know better next time. I agree with you Ramit, study and understand, but far more important to act even if you lose a bit of money or time. I did a case study on myself because my friend pissed me off by asking me for stock tips when he actually already knew everything I did but DIDN’T ACT. Action is better than knowing. Knowing + Action is best — I think this is generally your message too, if not in those exact words. Alex- I would even argue that one doesn’t have knowledge without accomplishments. Until they do have accomplishments, they just have information. The ability to take information and act with it produces proof of knowledge, or accomplishments. I wrote an article sharing an experience with my 3 year old about this topic: http://wealthhabit.com/blog/3-levels-of-learning. Wow! Sorry you had to put up with that little attack Ramit! I have read your book and thought it was very good! I think some people really just won’t ever understand. I am going with option 3…but I must say I am surprised the author of this site is so reluctant to accept that gold/silver can be a valid investment going forward. How bout the folks who put their money 10 years ago into the market…where are they now? Right where they started if they are lucky. And the neighbors who put their money in gold at the same time?? I am of the opinion that, based on the current world dynamics, including the ever growing debt ALL nations face that is based, on fiat currency, a healthy amount of physical gold under the mattress is a darn good investment. Of course, I also have a good deal of cash. And some of the market (though I think its overbought). I believe this will end one of two ways. Inflation or deflation. Folks, like the author of this website, who preach the “same old, same old”, may be in for a rude awakening if they are not properly positioned for either. Can we limp on for years? Sure. But I bet we go one way or another in the next few years…up or down…the dollar will tank or soar…that is why I have my nest egg squarely in the middle. Think we are in 1995 again when any investment will raise in value? Good luck with that. Do you think you know more than Chase, Goldman Sachs, the United States, or China? There is no way these idiots who have never read a book know something that the Fed doesn’t. Markets are efficient, and unless you have an edge in technology or research you’re not going to outsmart the millions of other investors and get a “great deal” on gold or silver or international funds or junk bonds or whatever. steve, I’m not sure where you’ve been investing, but my 401k and roth IRA are doing quite well this year. 401k 17.8% last year 6% so far this year. 12.3 and 7.2 for my Roth. To be honest, I’d rather not have these high gains now and be able to purchase more shares since I’m 40 years away from retirement, but I won’t compain. ::sigh:: This is why I stopped participating in online financial discussion boards and took down a blog about my personal finances long ago. Too many guys — and somehow it’s mostly guys — who KNOW the ONLY RIGHT way to invest, and anyone who does anything else is crazy, ignorant, and stupid and must be attacked RIGHT NOW. So now I just quietly read the best blogs and books, ponder and test the information, and do what I can, when I can, as best I can, to invest and save. I’m not perfect, and I’m not terribly consistent, but if I’m not performing up to to snuff, it’s my own fault. – Learn voraciously from various sources. For things about comparing precious metals [PM] vs equities vs bonds, there are tons of boards out in the ‘net! Man o man, i feel like i’ve met this person before. I’m in wealth management and it’s ridiculous how many ppl have knocked on my door in the past 6 months and say “how can i buy gold?” When i tell them not to buy it, or that if we were, i’d only be a small part of a largely diversified, they get upset and never know why. Then they proceed to tell me some jackass on a news show told them gold was going to 3500 dollars. Stupid ppl with access to news is a scary thing. Seriously, if you’re buying gold/silver because the economical system might collapse, by rice, land, fabric etc, or even oil if you’re a dare-devil. Although the crude language and image of Vito here does not represent the majority of intelligent precious metal investors, I would have to agree with Vito’s general position here; even if it’s not advisable to invest everything in one basket. Advocates and investors of gold include Jim Rogers, China’s and India’s Central Bank, John Paulson, Peter Schiff, Marc Faber, Doug Casey, David Einhorn, the Univ. of Texas Endowment Fund, Richard Russell, George Soros: Google some of these names if you aren’t familiar. These folks have solid credentials and funds like China’s central banks and these hedge funds have more money than God and they decided to invest in gold. I follow Mr. Sethi for his personal finance recommendations. People must understand that the financial industry and media will ALWAYS bash gold because it doesn’t produce fees for them. CNBC, The Wall Street Journal, Fortune, are listed interviewers here. Long term? Who is say Vito can’t take profits in the next couple of years or decade. Long term? Gold and silver have been money for 5000 years. The value of the dollar is in real trouble, and it would be a danger imo NOT to have any gold or silver. Feel free to check this comment in a few years to see who was accurate. Kevin G, but why is gold better than for instance land? I think a lot of investors choose Gold/silver over land is because of the cost difference. I can get a Silver Eagle for $20 dollars vs. an acre of land for 20k. Stefan, no one said one was better than the other. They are BOTH important to own. Well, if you actually believe in an economical collapse, you should probably just loan as much money as you possibly can, and buy _useful_ resources for it. When the banks go under, you’ll win. Unless you loose all your resources. Acctually, that’s not really true. When the banks go under, they’ll just get bailled out again, and then take the resources you borrowed from them to get. Your dumb people rant articles are always my favorite. Nothing like listen to stupid people and realizing life’s pretty good. Michael: Land you can farm, weapons, food, water. Agreed. Or live like the apocalypse isn’t around the corner. A matter of lifestyle I guess. Again I think folks (including the author of this website) are confused. It does not need to be “all or nothing”. Gold, and to a lesser extent silver, serve as currencies. In the same way the dollar, the yen, pound, etc, serve as currencies. Used to be all currencies were tied to gold…but that changed not too long ago. Now all currencies with the exception of gold are fiat…meaning that they can be created at will. If you follow what our current monetary policy is, you would know we are doing a lot of that now. Now, unless you are a proponent of Modern Monetary Theory (MMT), it seems to me there is no real, or at least no clear path out of the mess that TARP and QE1, QE2 and likely “QE whatever is next” holds. I, and many others, believe that there will be either inflation or deflation. Which one? Pick your expert…there are plenty in both camps. And compelling arguments they both have. Regardless, gold serves as a hedge…a good hedge for both inflation and deflation. He may…or he may not. My point is that folks who dismiss the value of gold as a commodity…and the author seems to blame this on not reading books?? Is that the key to financial wealth?? I read quite a bit. I mentioned MMT earlier…is our host a proponent of MMT? IF not, perhaps he can share with us how, exactly, gold is a poor proxy for currency…or why gold will not continue to increase in value relative to the US Dollar?? Aside: Its all about store of value at the end of the day. Put your money into what you believe will survive this coming mess…if you believe there is a coming mess. Gold has served as currency for many, many years. Our fiat dollar for far less than 50 years. And you want to say “stay away from gold, its not safe”?? Nice post, Ramit. Reminds me of the bookmarks you have on psychology related to how people’s inherent beliefs corrupt their ability to take in real facts that conflict with what they already think. I have a lot of people come to me at my office asking for my opinion on certain stocks that are “sure to gain so much money this year!”, but when I tell them that it doesn’t matter how much they gain this year since they’re investing for retirement/long-term goals, they give me a blank stare or try to rationalize. Educate those willing to learn, cut your losses on everyone else I guess. Fundamentally, I find it mind boggling how anyone can argue with diversification, in investing, income production, etc. I’m surprised you actually wrote back – I think I would have deleted the email after the first sentence. On another note, good to see some focus on your SEO strategy with in page anchoring. However, to drive more traffic, you could make more effective use of your page titles (huge for SEO) and meta descriptions — often relied on by search engines for the blurbs when your site is listed. Your description for this page is “Sigh. An email I got recently. Vito writes: Love your name btw. Just ram it! lol. My investment strategy is non complicated. I invest everything I” — not likely to encourage a click through. Oh, the irony! As I was selling my gold to an end user (a jeweler), I felt bad for them that their regular supply prices are so outrageous. But I wish I had sold my gold to this guy! I hate to sound like him, but with his mean-spirited attitude towards people he thinks are less knowledgeable than himself, I have to admit I take pleasure in knowing that he’s going to be royally screwed when the bubble bursts. No, I still actually feel sorry for him. He will lost so much hard-earned money. He doesn’t deserve that, even though he sounds like a total sociopath who would certainly laugh at my misfortune, if I lost all my money. Not to mention – his metaphors are highly disturbing, especially paired with his glee about the metaphors occurring. The only intrinsic value that gold has is its superiority as material for a dental crown (longest lasting material and does least damage to opposing teeth). And they don’t even use anything near a high karat gold to make crowns. FYI- J.D. Roth at Get Rich Slowly did a post about gold today. I’m really tired of the doomsday approach to investing, and the advice that comes with it. So many people are convinced that you need to have all cash, or commodities, and think little about the stock market anymore. Mutual funds, and dividend paying stock, etc.. are still very viable sources of investment. If we have meltdown of all the financial markets, and the world goes under, I doubt many people are going to care about a bar of gold at that point either. Phillip, how is gold not fiat value? It seems that it’s worth whatever people decide it’s worth. Even for something that has intrinsic value such as a home or property, a drastic, unusually fast increase on prices is the sign of a bubble. Reading books on finance will teach you the basic investment strategy of “buy low, sell high” and about the concept and history of economic bubbles. People instinctively feel that now is a bad time to buy a house and a good time to buy gold, because home sales are doing so poorly and gold is selling for such high values. But now is the best time to SELL gold if you want a high return on investment – because the prices are unusually high. Now is the best time to BUY property if you want a long-term investment – because the prices are unusually low. Even if I thought that the safest investment is an investment in human ignorance, and I wanted to buy gold as a long-term investment strategy (betting on another bubble in 20-30 years), I wouldn’t buy gold NOW. I’d buy it after the bubble bursts. But based on this bubble, the biggest ever, and assuming gold drops as low as $300 per ounce, I would still not be making as much ROI as I would if I just put my money in a savings account. Personal tolerance for risk is the indicator needed to invest in any source of investment you make. Exit from the investment is about the only thing that matters as you will either have realized gains or loss at that point. I am sure if you ask around we can find someone whom we personally know that got clobbered in their 401k just at their retirement, or someone who lost in real estate, or gold or whatever. And also people who benefited from it. Seems to me most of the time people calculate their unrealized gains as actual gains to gauge their performance. how is gold not fiat value? First, lets address fiat. Fiat means “by order”…something that is fiat is created by order or proclamation. That defines all sovereign currencies today. And the value of the currency is determined by the market. Today, for example, one dollar will purchase 1/1,500 oz of gold, or 80 Yen. That will go up or down as dictated by the market. The cool thing about gold is that it is not tied to a particular currency…it has a value worldwide. And this value is NOT based on the US economy…as our dollar is. US economy tanks the dollar drops…but not gold. How to value gold…man, that is a great question…for that I suspect there is no easy answer. But let me say this…part of why gold is so valuable is that it has no other value AND because it is hard to get (it takes a great deal of effort to extract gold from the ground). If there was some other value to gold, then you would have markets competing for it…which could skew its value. Counterintuitive? Yea…but not so much. 3. Able to store value. This is why gold shines. It is recognized world wide as a store of value, is potable and you can trade it 24/7. And it holds value…or has for 5K years now. What is that value? It is, like with the dollar or any other currency, what the market places on it. Can the market cause the price of gold to drop? Like a rock…you bet. Much like our dollar (or your pound) have dropped over the past 10 years. And as I mention, I hold to diversify. To PROTECT, not to multiply. But I bet it continues to rise vs the dollar. I *still* wish I’d saved for the big wedding and/or the kiddies. If I’d had that kind of cash in hand, I could have helped my wonderful nephews with their college tuition, or helped my mom with medical expenses (I do, but I wish I could do more). If nothing else, I’d have a nice, supplementary nest egg to complement my present nest egg. So save money anyways. Even if you don’t marry, you’ll still have it for something else. These are very good points, and I agree with them. But I reach a different conclusion – 10 years ago was a great time to invest in gold, because gold was cheap. Therefore, now is a terrible time to invest in gold, because its value is so high. Regarding the other thing – I have always been wary and resentful that we are expected to gamble our retirement savings. And I’m also wary of anyone who says not to pull your investments when the market starts doing bad. Yeah, I’m going to leave everything where it is and lose another percent of my savings next month? I don’t think so. I basically consider the company match to be my return on investment, and put my 401k money in the absolute safest bonds. Actually, the ones who put their money in an index fund 10 years ago are probably not screwed in any way. But 10 years isn’t really that long of a term either. There’s a reason for the old saw: “Experience is the best teacher.” Gold and silver are in a bubble right now. They’ll go down again just like they have in the past. Gold hit a high of $850 in 1980. 2 years later it hit a low of $296.75. It didn’t go above $800 again until 2007. I would argue the dynamics today are FAR different than in 1979. One of the reasons, if not the reason for the “bubble” in gold was the end of bretton woods. That lead to the drop in the value of the dollar (priced in gold) and increase in the value of gold (priced in dollars). Paul Volker was able to curb the inflation (and there was inflation) with a very high interest rate. Think that will happen again? Its good to understand why things happen…not just repeat what the folks in print and TV say. I certainly am not arguing that gold can or will not fall in value. Frankly, I hope that it does…if it does, I will buy more. That is a fairly bold statement. Would be great if he could possibly tie that to an economic model he believes will cause that. I do agree with a good deal of what the host prints…but I felt compelled to call him on this one…my money is on gold over the US dollar for the next 15 years…but that is just me. But back to the bubble argument…just because an asset increase in value does not mean its a bubble. Again, it is wise to understand the reasons for why things happen. Its not random that gold has skyrocketed…heck, many people, much smarter than I, called this years ago. If you will consider gold as a currency and NOT a commodity then all you have to do is ask yourself, will the dollar or yen or pound, or whatever, be stronger or weaker relative to today in 15 years. If you believe it will be weaker (if you think printing money could possibly make the dollars in circulation today worth less) then how do you protect yourself? Once you frame the question the answer is easy. The fact is, nobody knows whether gold will go up or down today, tomorrow, or 15 years from now. Time and time again studies have shown you cannot time the market. I believe this blog is targeted to the beginning to average investor and thus gold as an investment may be too risky from that standpoint. For me, Ive been heavily in a gold position since 2005 (>50% of total portfolio). It has worked out, but my risk tolerance is very high and Im young with a desire to chase high returns. Im slowly pulling some of my chips off the table, but not all. Plot the increase in gold price as a percentage of the long term average and compare that to same for the Nasdaq bubble. This would suggest gold still have a lot more room to go before hitting the top of a bubble. Then again, the price increases are being driven by different forces. Good luck to all investing in this environment, it could certainly get interesting. Sadly, many people really do think that the current market is somehow the end of days, with zero perspective on how BADLY the 1970s ended (we’re not waiting in line for gas and having Russian nukes to fear, oh and they had just as much fear from terrorism as we did, all this to go with the unemployment), and people focus on very short term ideas. Ignoring history is the wrong thing to do, period. Quoting the Black Swan, while that’s a cute little “look I’m learned” trick that may impress a teacher in college, is still missing the point that you plan around historical returns but also be prepared for a worst case scenario. You still with me or are you already writing a knee jerk rebuttal? If you are truly scared/paranoid about the future, you should invest in gold, but THEN remember that the Black Swan “event” would be business as usual, i.e. buying stocks in a pre-freefall and during freefall, even if it’s 5% of your portfolio. Putting all your swan eggs in one event basket is truly foolish. If you believe the modern market is the “enemy” and stock investing is idiotic, you should at least read a personal finance book if for no other reason than to do reconnaissance on how the “other side” gets by. And lastly, the immense amount of cursing doesn’t make one single sentence of an argument any more important or factual. If you can’t present an argument without loading up on f bombs, you probably need to go back to the drawing board. Ramit, your site is fantastic. Thanks for taking on these discussions. I 100% agree with the “other guy’s” underlying theory, although he doesn’t present his ideas as elegantly as you do. I recently reduced my 401k investment from 6% to 2%, and with the surplus of 4% I invest in precious metals. I invest as little of my “money” into the stock market. After Nixon made the change to our monetary system in the 70’s money is now just currency, and I don’t plan on investing in the stock market. After all, every fiat currency in the history of the world has failed. I am not sure what keeps Americans believing we can just keep spending fake money that our government prints endlessly. Call me crazy, but it seems to me that the government is running the largest counterfeiting operation and Ponzi scheme (our economy is based on unlimited growth, which is unsustainable) in the history of the planet earth. Matt, just out of curiosity: When the economical system collapses, what do you plan to do with the metal you’ve purchased? And also, where are you storing it? Somewhere safe that you have actual physical access to even if a domestic war starts? Its worth noting that holding gold does not necessarily imply collapse. Consider the Deutsche Mark…it went through several periods of very serious stress (after 2 wars) yet emerged strong. My point is that the dollar may not “collapse” to the extent that we have fighting in the streets. Frankly, I personally doubt this will happen. But if, say, the dollar falls another 10% or 20% ? If that happens how do you plan to protect what wealth you currently have? As for the 70’s? I was around in the 70’s…that was bad…this is different. Not saying better or worse but different. SO not sure you can make an analogy other than that was bad and what we are in now is bad. Yes, but if you’re talking about “short term” “collapses” that would be devastating to you, you shouldn’t buy gold OR stocks. If you’re in it for the long term, the short term “collapses” are of no concern. I disagree. If you believe (I believe) gold serves as a currency, the holding gold can help hedge a collapse either short or long term. I do agree that if you are worried about collapse you should not by stocks…but that assumes a deflationary collapse, as opposed to a hyper inflationary (like what happened to Germany in the early 20’s). IN a deflationary collapse, the dollar will be king and all prices will drop. Which is why I am split between the dollar (the strongest fiat currency there is in my opinion), the market, and gold (the strongest currency there is, again my opinion). That way either way I am hedged…I do not hope to get rich…I just want to try and keep most of what I have. This is actually not that complex…but it does require some effort to understand the concepts. But if consider the alternatives I would say time well invested. Again my point to the host of this forum was that to dismiss the notion that gold is a mistake…if they are just voicing a blanket statement like “gold is a bubble” or “gold is not a valid investment” that does not make sense. You may believe gold is over priced…but in relation to what?? Well at least he doesn’t have all his eggs in ONE basket. Gold and silver counts as two, right? Even though gold seems to be the focus, and is certainly the high value item… he has 75% of his money in silver. Just me who thinks that’s a lot? Maybe it’s because I have family who deal in silver and gold but I find silver more volatile in its prices over the short term than gold, so 75% is a lot of faith in a metal that dropped $14 an ounce in a week (about 30% of its value)…. That being said I remember when it was only $11 an ounce a few years ago so maybe he’s on to something if it’s been able to hit almost $50. Still if I saw 75% of my money lose that much in so short a time, it might give me an ulcer. SLV and GLD have outperformed the SPY. I think they are a good part as a *portion* of your portfolio. Of course not a majority. And don’t get SLV unless you want to swing trade. Too hot as an investment. But I don’t think it is fair to say that they severely underperform, GLD slightly outperforms SPY on a ten year chart, and SLV beats it. I’m fully aware SLV has plummeted. But the fact remains it has still outperformed SPY on all my charts from three months to ten years. I did mention as well that it is too hot to play as an investment! Sounds like a friend I know. He bases his information on sensational “news” finance articles and has EVERYTHING invested in gold and silver. And he keeps it in his house. Not in a safe, just a cloth bag in the closet. WTF? While I don’t think it’s wrong to invest some in gold/silver, everything is just ludicrous. Arguing between gold, or any commodity that you don’t actually plan to use and market investments is a bit of a dead end- both of those have the same basic characteristic that they depend entirely on speculating on how much you’ll be able to get someone else to pay to take your investment off your hands down the road, but they don’t actually create anything and so making those investments doesn’t allow any active way to actually affect the future value aside from, particularly with gold, encouraging as many people as possible to fight over the available supply. Here’s the real question- what would you have if you had invested that same money in a capital project instead? If you had taken Ramit’s advice here and used your resources to help you start your own business on the side and invested in the tools and training to increase your abilities, customer base, and rates? Imagine, just for a moment, if Ramit had put money into gold instead of IWTTBR, Earn1K, and the like. Would that have really been the better investment, from any angle? That also points to the biggest flaw in speculative investments. The utility is all one sided. If you buy gold, you’re trading something immediately useful (money) for something that you can’t can any immediate utility out of (unless you’re a smith, dentist, or researcher in certain fields) your ability to create value from that investment is effectively 0. Since you can’t create value, you can’t transmit any part of that value, and the overall economy grows more slowly as well and effectively adds nothing you your future income potential; you’re completely dependent on other people to drive appreciation. On the other hand, making an investment that enables you to keep reinvesting the proceeds on an ongoing basis in more growth means that you’re pushing more activity out, and if even a small portion of that feeds back to you, you’ve managed to create a positive feedback loop- the more you invest, the more your future income directly benefits from your active agency in that investment. Gold provides no dividends. Stock investments provide some dividends, but unless you’re a Warren Buffet you’re pretty much dependent one the agency of others for those dividends. Investing directly in your own projects, though, gives you full agency and access to the future dividends on that investment. And with that, the debate is done! Just like dat. No more comments now, go home people, nothing left to see here. I think this post and the ensuing comments mark the beginning of the end of IWTYTBR as a legitimate, respectable personal finance blog. Ramit has moved into the territory of writing shock posts to generate as much controversy in the comment section as possible. I for one will not be returning back, as I have no interest in watching the downfall of this site. 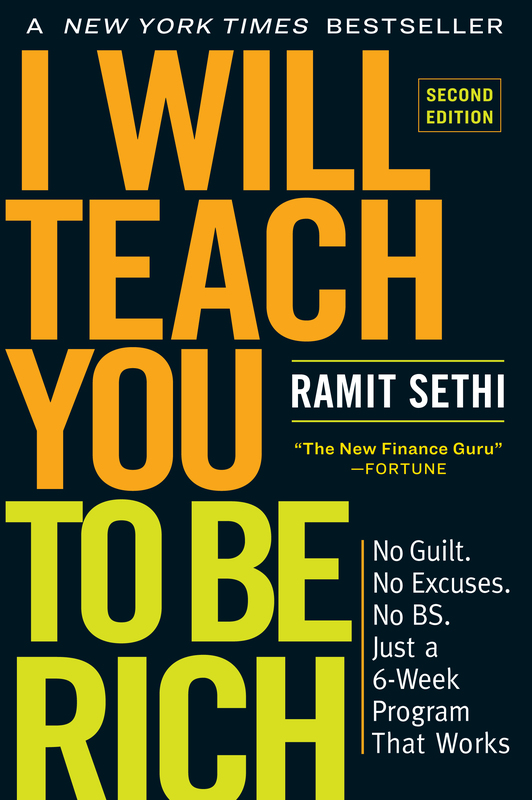 Thanks for helping me automate my finances Ramit and for showing me some useful tools in your book. I wish you the best of luck. I am glad he has found himself a strategy that he thinks is good and that so far has been working for him. But I agree, you cannot get too much actionable knowledge. He should read books, listen to audios, maybe attend seminars. If you are not open for input and more information over the long term you don’t have a chance and you will miss many opportunities. You bring up a great point Daniel. The biggest thing that this guy doesn’t have going for him is that he’s unteachable. His certainty will cause him to lose his shirt beyond any investment strategy. Good lesson for all of us. If you buy gold, you’re trading something immediately useful (money) for something that you can’t can any immediate utility out of (unless you’re a smith, dentist, or researcher in certain fields) your ability to create value from that investment is effectively 0. That logic is flawed. Gold is often viewed as a commodity. It is…but it is also a currency. And your argument fails to account for this. The gold market is open longer than the equites market…you can trade gold all day, most every day. So it is very liquid. And it has inherent value. Has had for MANY years. All over the world. True, it does not pay a dividend. So you have to decide if the lack of dividend is significant to your reason for holding this asset or not. The 10 year bond is paying approx 3% now. Is that enough to cover inflation in 10 years? If the economy continues to fall and we have deflation? Then that 3% will be a wonderful return. If inflation kicks for real? That 3% is nothing. Because gold trades as a currency, it serves a valuable hedge…protection. I think the folks who argue “gold is going to $5K or $50K or whatever” are misguided. No one can say if that will happen or not. They are as misguided as the folks who claim that gold is in a bubble. Bubble? Really? Why? Because it has increased in price? Is that it? Or are you repeating what you heard on some tv or radio show…or from folks like the host of this forum who discount the utility of gold as a currency and hedge to a fiat dollar with no basis or economic model to support the assertion. Look, anyone with a voice can shout or with fingers can type…but typing and/or shouting does not make it right. I didn’t want to read past the first “lol”. I did anyway and regretted it, sort of like when arguing with talk-radio-educated people. The price of gold has always been inversely proportional to the stability of the money markets. The current high price reflects the current instability in the stock markets. The fact that the price of gold remains high indicates that a lot of people are not so sure that this will cycle, as it has in the past; The shrude bet that due to many factors mostly involving limited resources and more people vying for said remaining resources, economic recovery will not happen as it has in the past… if at all. Environmental collapse portends economic collapse. Isn’t the invisible hand great? My adivce? Invest in local, sustainable, self sufficient industries. eg: A community owned windmill, a local organic co-op, water processing plant, etc… Either way, if the economy recovers or not, you will be helping the environment and protecting yourself… & who knows might make a bit of money too. You can’t eat cash or gold. I like gold and silver plus other investments are interesting too, like real estate but more than all of that simply doing something I love on my own terms instead of slaving away at a job I don’t enjoy (errr..hate). Compare how much you can buy with an ounce of gold (or silver) now and how much you could buy say in 1980 at the height of the bubble. This effectively leaves the dollar out of the equation. For example, how many ounces of Gold does it take to buy a share of the DOW? To buy a house? To buy a barrel of oil? Comparing this gives you a clearer indication of if we are in a bubble right now or not. Dave Ramsey was saying last night that gold has had no significant return except for in the past 8 years based on fear. Fear is the only reason that gold spikes and that once the fear is gone their investments will be half of what they are now. Balancing that with the mass-printing of money around the world, it will be interesting to see. The argument for gold & silver is by it’s very nature against the best investment advice ever – don’t be reactive, be proactive. So many “investors” see a stock rising and immediately buy it, then freak out and sell as it drops, losing money with every snap decision. The gold & silver markets are being fueled by doomsday prophecies and the snake-oil salesmen behind every 3rd radio spot Sirius has and it’s triggering that same reactive fear in people. Just think of the two corner cases: imagine an economy where everyone invests every resource they have into acquiring gold vs. one where everyone invests every resource they have into producing things to sell to others? One results in a vital and growing economy, the other results in everyone being dead, from wars over gold supplies and eventually starvation, because no one is even allocating resources to growing food. Right there you can see why gold isn’t the best long term investment. It’s a penny-wise, pound-foolish investment. Odds are, you’ll make a financial profit on it, sure. There’s too much blood and history invested in gold to make people admit that it’s a fundamentally useless investment short of a severe enough economic shock to force everyone to invest only in survival needs for a significant amount of time. And that’s a shame, because every dollar invested in gold is a dollar that’s not invested in growth, which means there’s a net loss in future wealth.and innovation. Remember the initial context isn’t whether gold is sure to produce financial returns, but whether it’s the _best_ long term investment. It’s categorically not the best investment, because it produces nothing. The entire economy, yourself included, loses out on that investment both in the long run and in terms of immediate utility. KRG, just ask yourself that question: is every dollar printed in the rounds of Quantitative Easing invested in growth? I fear it is not, it’s only driving prices higher, effectively devaluating your hard-earned dollars. So who is to blame, the individual that buys precious metals to protect their wealth or the governments that run the printing presses and devaluate the currencies? Comparatively few dollars were printed with QE, most of the asset purchases involved padding the reserve balances of banks so that they were more free to loan out their existing capital. We’d be much better off if it were being actively invested, but Congress has dropped the ball on its duty there and is cutting spending when it need to be investing more in filling the hole that we’re in. Currency is a means to acquire wealth and a medium for transferring value. It is not, in and of itself wealth. Printing more currency may risk devaluing currency, but it if does so, it actively increases the nominal value of wealth in that currency; only debt gets devalued in the process, which is part of what we need to be doing now to help get people out from underwater states and back into a state where they’re not trapped away from being mobile and flexible enough to invest their efforts in growth. Currency is a means to acquire wealth and a medium for transferring value. It is not, in and of itself wealth. I disagree. One of the functions of currency should be a way to store wealth. If currency can not store wealth (value) it is flawed. That is why the dollar and fiat currencies are flawed. They do not effectively store wealth. That is a problem if your goal is to maintain your wealth. For thousands of years gold has been used to store wealth. It is very good in this role. KRG also urges investment in society. I agree…good idea. But investment is a separate concept. Investment and storage of wealth are, I would argue, vastly different concepts. Gold is an excellent store of value. Investment? I agree, in principal not a good one. But when a fiat currency is set to devalue or adjust in value….it sure looks like an investment…that is, when you expect the asset to appreciate in relation to the fiat currency, it works like an investment. And while that may be true if you pick a very narrow window…if you look over the the course of history, gold has held value better than any other currency. It “performs” better then many other investments. And is on par with many others. My point is folks can treat gold (and to a much lesser extent silver) as a currency. A store of value. It also functions as an investment. Is it a socially responsible investment? I agree with KRG. No. But I am concerned, first and foremost, with mine (my family). And I believe gold is a good way to protect the wealth I have managed to gather over my life to my family. Selfish? Yep. I give quite a lot to several local charities…but I have an interest in preserving what little wealth I have for my children. When the author of this forum implies that gold does not serve the purpose as an investment, particularly with no biases other than “some books”? He does a disservice to his readers. I agree with Vito to some degree on this one. The main thing I disagree with him about is that he’s putting everything into gold and silver. I don’t think putting all your eggs in one basket is a good idea, unless you’re investing in a business that you know to the most granular detail — preferably your own business. Plus, I think Vito would be wise to sell a substantial portion of his gold and silver — like 90% — before 15 years are up, since I think it’s highly unlikely that they will outperform general equities for that long. But regarding the stock market’s outperformance vs. gold and silver over various time frames — this is a really tricky thing. First, remember that gold was a regulated asset until 1971, with a fixed price. American couldn’t even own gold, except for coin collecting, until 1974. Also, gold has tended to be a superior investment to equities when equities have been in long-term bear markets — like the ’30s, ’70s and this past decade. Silver usually follows gold, but with more volatility. There is no “proper” way to view gold and silver, I don’t think, but I think the prudent way, from an investment point of view, is to view gold as an alternative form of savings to currencies. If you want to save more, but lack confidence in currencies, like the dollar, euro, etc., gold is the default savings allocation. It’s the fact that gold has very few practical uses that makes it a superior choice as a currency to stuff like platinum and palladium. The personal finance books that use backtested data to demonstrate asset superiority give investors the impression that they can mechanically invest their savings and achieve certain results. But I think this is dangerous. If a person is going to allocate their savings in anything but their home currency, they really need to understand what it is they’re investing in. Bonds have done well since the early 1980s, but in the early ’80s, bonds had been a terrible investment since the mid 1940s. Likewise, a person avoiding equities in the early ’80s on the grounds that they’d been a poor investment since the mid-60s would have missed the biggest and longest bull market in US history. Simple: If you do not diversify how you invest you will end up getting hurt, big time. It is smart to invest in Gold and Silver, no one is discounting that, but putting all your eggs in one basket is ridiculous. This is the type of guy who, due to his lake of eagerness to educate himself will actually be paying a premium on Numismatic Gold coins; thinking he is making a smarter investment because the guy on the other end of the phone is telling him about confiscation laws so he can collect a higher commission on the gold he sells you. Gold and Silver are supposed to be utilized as a tool, a HEDGE against your other investments. When the stock market goes down and their is turmoil, your gold and silver will go up. When the stock market rebounds Gold and silver take a dip. You can’t say with certainty that he’ll regret it in 15 years because currently he is right to some extent about the sovereign debts of many nations around the world. Investing in gold and silver is better than investing in nothing; investing in nothing is better than spending his income on junk. As long as that guy doesn’t spend his income on junk and consumer crap then he’ll be fine. I have to agree with you on this one, how can you blindly invest in anything? It is better to educate yourself on any topic regardless of how much you think you know, rather than invest on an apparent guess. Also, people who swear and rant like that show their true colours and class, which also shows (in most cases, generalizing here) education and intelligence level. Good for you for trying to offer him resources though, too bad he isn’t willing to educate himself. Bonds, cash, gold, silver, precious stones, land, tools, perishables (like food), skill sets – as an investment and insurance – all have their cons and pros. There are underlying assumptions and predictions for future that define which seem better or worse. From worse to worst expected – bonds, gold/silver/precious stones, land/tools/perishables. And for all occasions – skill sets, though they are diverse and applicable to some scenarios better than to others. My take on it – it’s good to have diversified investments, with percentage varying depending on current situation and predictions, but also stashed gold, staple foods, tools of trade and survival, medicines etc. Stash of staple food is actually quite good thing to keep – you simply buy it in bulk when there are Big promotions, and eat it slowly away, buying more at next promotion – this way it doesn’t get spoiled and still you can live on it for months in case of emergency. Drugs and first aid – the same thing, though here some throwing away is probably unavoidable. Cash, gold, precious stones – while arguable investment, are very condensed form of currency – something you can hide very clever to grab it fast in dire circumstances and run. Many argue that gold have very little uses so it’s not such good commodity, but they forget that it is deeply rooted in people that gold is always precious. So it is a form of currency that works even if all other money turns into paper and circles of metal of no value. And it is a condensed form of currency you can easily carry if you need to be on a move – unlike food or water or other basic but heavy stuff. But apart of emergency stash, and perhaps some land, the best bang for the bucks is and always was in the skill sets you acquire. Use your time and money on sabbaticals where you learn to survive in wild, work field and garden, care for farm animals, make things using hand tools – and other skills that can be useful in most basic environments. Treat them as a hobby and precaution and you will be well off. Of course continual learning and becoming best possible in your chosen field of work is a very good investment as very good specialists have it much easier to find work even in bleak work market. One egg in basket is obviously foolish, but lets not forget that not only things matter – skills are as much and often more valuable. My 2 cents. Every investment needs to be looked at from time horizon point of view. Keeping money in checking account would not be good for time horizon of 15 years but would be good for time horizon of 15 days. For ultra long term, that is beyond life time of an individual, Gold is store of value in the sense that it protects its purchasing power. It is said that an ounce of gold would buy you more or less same basket of basic necessities now as it would have 100 years back. However, same is not true if time horizon is 15 years. See, these things move in long term cycles. For example, Dow was at same level in 1982 as in 1966. This is 16 years of bear market. It went up like never before between 1982 & 2000, 18 years of bull market. It is again flat since year 2000 till date, roughly 11 years of bear market and still counting. Gold was also declining from 1980 till 2000, about 20 years of bear market. It has been moving up since year 2000, roughly 11 years and still counting. Therefore, it would not be surprising if Gold continues its bull market for another 5 to 10 years and this guy Vito actually ends up playing it very smartly and make tons of money by exiting at right time. Though I do not like Vito’s attitude based on what is written in this post, I feel it is equally arrogant to assume that this guy would regret his life in 15 years time. I would argue that you can extend that (what else has held value for thousands of years) or, I believe, can bring it in. Today is a good example. The down tanked, the dollar tanked, commodities tanked…but gold rises. Yes, the price of gold will fluctuate wildly going forward. I would bet a lot on that. But if you look at the paper currencies out there, the yen, the euro, the dollar…all are flawed. Look the author of the website can claim that a particular gold bug is an idiot…and be smug in doing so…but at the end of the day, next year, 5 years from now…what will hold its value. That fiat currency so many of us measure our wealth in? Or gold. Gold is a terrible investment to be sure. It underperforms just about every other investment over the long term. But that’s not the biggest reason not to invest in it. First, we have to ask, why do people think that holding gold is a good idea? Well, the biggest reason is to be secure in times of economic emergency. Here’s the problem with that. The Federal Govt under the Emergency Banking act of 1933 which amended the Trading With The Enemy Act of 1917 has the power to confiscate ALL privately held gold in times of ……wait for it…..”Economic Emergency”. They’ve done it before and they’ll do it again. FDR issued executive order 1602 in 1933 which outlawed the private ownership of monetary gold. The penalty for not turning in your gold was 10 years in prison. So, for those that say “I just won’t turn my gold in!” What exactly are you going to do with it if it’s illegal to own it?? Burry it in the back yard? Hide it under your mattress? Commodities like gold and silver are worth what you say they are worth. Stocks provide income. They have balance sheets, income statements, cash flows etc to compare from the same industries and sectors. Stocks produce income. Gold and silver are the worth investments. I have 100 percent of my money in stocks and I guarantee you in the long run 20-50 years your gold and silver theory will be slaughtered by stocks. Firstly Thanks to every one for share gold trading tips or related info. we are SEBI Registered tips provider Company Get trading tips from the leading advisory in the commodity market. Subscribe to accurate commodity trading tips from Zoid Research. Stay on top of the Indian Commodities Market with us.